"Sampath Speaking" - the thoughts of an Insurer from Thiruvallikkeni: Import of rice - Yingluck Shinawatra's policy backfires !!! Import of rice - Yingluck Shinawatra's policy backfires !!! Agriculture has been mankind’s primary activity for centuries. Thiruvalluvar hails ‘Uzhavu – Agriculture’ by saying that though laborious, it is the most excellent form of labour; though people would go around in search of various employments ~ all will have to resort to the farmer at last ! There is an ancient royal rite held in Cambodia and Thailand called the Royal Plowing ceremony ~ which marks the traditional beginning of the rice-growing season. Known as Mingala Ledaw, it was also practiced in pre-colonial Burma until 1885 when the monarchy was abolished. Rice is a popular cereal crop commonly used as human food. Rice is rich in nutrients and contains a number of vitamins and minerals. It is an excellent source of complex carbohydrates—the best source of energy. A lot of these nutrients are lost during milling and polishing, which turns brown rice into white rice by removing the outer rice husk and bran to reveal the white grain. Rice is grown in more than a hundred countries, with a total harvested area in 2009 of approximately 158 million hectares, producing more than 700 million tons annually. About 90% of the rice in the world is grown in Asia (nearly 640 million tons). Sub-Saharan Africa produces about 19 million tons and Latin America some 25 million tons. There are some special varieties like the famous ‘Basmati rice’, a type of aromatic rice, grown mostly in India and Pakistan. It is renowned for its long, slender shape that elongates rather than expands in width when it is cooked. The word basmati means "queen of fragrance," and the rice is distinguished by its aroma and taste. Do you what ‘jasmine rice’ is ? Globally, rice stockpiles are expanding to the highest level in 12 years as production increases to a record, adding to a worldwide surge in agricultural output that is poised to diminish the $1.1 trillion global food-import bill. Rice is not exclusive to India [we South Indians think it so !!!] Rice is economically and culturally important to Thailand. The country lays claim to being the producer of the coveted, high-quality rice and was for long the world's top exporter. Rice occupies 55% of Thailand's arable land, and it is the staple food of the population across income brackets. Ceremonies invoking rain and bountiful harvest are commonly performed by Thai rice farmers before planting seasons. Rice production in Thailand represents a significant portion of the Thai economy and labor force. The most produced strain of rice in Thailand is jasmine rice, which is a higher quality type of rice. It is distinguished by its fragrance and a water milling process that leaves the grains silken to the touch. The grains are similar in size to long-grain rice but cook moist and tender like a medium-grain rice. The variety has a significantly lower yield rate than other types of rice, it normally fetches more than double the price of other strains in a global market. It is stated that a large portion of this rapid expansion was due to increased production of rice in northeast Thailand where farmers adapted to newer techniques. By the end of 2012, Thailand had around 17 million tonnes of milled rice in stockpiles. While the common perception is that Thailand is the top rice exporting country, its premier position had been taken over by India and Vietnam last year. Its PM Yingluck Shinawatra is facing the flak on her attempt to manipulate the world's rice market by buying up supplies; it has damaged her popularity and cost Thailand billions of dollars. It is stated that the fiasco has toppled Thailand from its perch as the world's top rice exporter, with exports worth almost $US6 billion ($6.48 billion) a year, and threatens to downgrade the country's credit rating as the government tries to figure out what to do with all the rice. 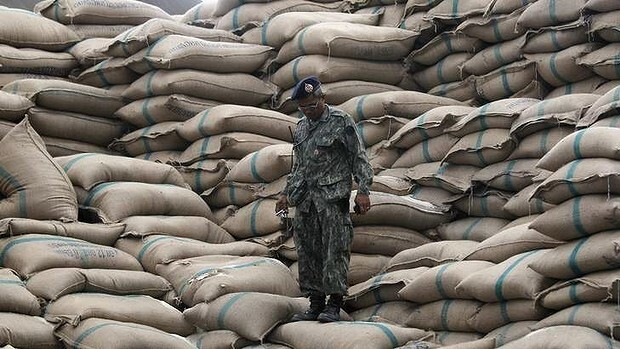 Hundreds of thousands of tonnes of rice are being smuggled from Cambodia and Myanmar into Thailand, although the country's warehouses hold enough stock to meet half the world's annual trade in the commodity. Ms Yingluck last week ate rice in front of the media to play down claims that up to 18 million tonnes of milled rice stored in the country are starting to spoil. Swept into power on a promise to support the rural poor in 2011, Ms Yingluck came up with a scheme to subsidise rice, not just a staple for Thais but an object of respect. Observers at the time saw the idea as her way of mimicking her elder brother, Thaksin Shinawatra, who introduced popular expansionist economic policies in rural areas before he was ousted in a 2006 coup. The plan was to buy up local rice harvests for as much as 50 per cent above market rates to drive up global prices. But the market saw it as a clumsy attempt at price manipulation. Rival exporters such as Vietnam and India stepped up production while Thai exporters responded by investing in emerging producers such as Cambodia, Laos and Myanmar. Global prices stayed low last year and the Thai government, still committed to overpaying for farmers' rice, amassed ever-larger stockpiles rather than selling overseas at a steep loss. Time is now running out, because rice goes bad after one or two years in storage. A government investigation found much of it gathering dirt, mould and mildew, so at the very least it will need thorough washing. Placing large amounts of rice on the market is also likely to push prices down further, analysts say. Farmers and traders in the neighbouring countries are capitalising on Thailand's problem by rampantly smuggling rice across porous borders to be sold into the Thai scheme for twice what it fetches in their own countries. Analysts and traders estimate the illicit cross-border shipments at 750,000 tonnes a year, adding to Ms Yingluck's dilemma over how to stem mounting losses over the scheme. The government said last month that losses amounted to US$4.4 billion for the Thai crop that ended in September 2012. Since the program began in 2011, the government has bought about 36 million tonnes of rice, paying farmers $US11 billion while earning $US1.9 billion by selling some. Losses from the scheme in 2011-12 could eat up 5.6 per cent of Thailand's budget, analysts say, prompting Moody's to cite it as a negative factor in the country's credit rating. As the political and economic fallout worsened this year, Ms Yingluck faced the stark choice of continuing to pay the subsidy to farmers or cut the payment and risk losing their political support. Last month she earned praise from economists by announcing that from July 1 the amount paid to farmers would be cut 20 per cent to 12,000 baht ($420) a tonne. But when the announcement brought protesting farmers to the streets of Bangkok, Ms Yingluck reversed the decision and sacked Commerce Minister Boonsong Teriyapirom, who was responsible for the scheme, replacing him with Niwatthamrong Bunsongphaisan, a government spin doctor. Mr Niwatthamrong says the government will sell up to 1.5 million tonnes of rice a month this year through tenders and try to sell to other governments. Now with the original scheme still in place and no apparent move to end or scale it back, Thailand's warehouses are reported to be so full there is little space left for the next main harvest, which starts in November. Somporn Isvilanonda, a senior fellow at the Knowledge Network Institute of Thailand, said given the volume of rice in storage it is almost impossible for the government to care for it. "The quality of rice in storage drops each day," Professor Somporn said. "The question is how badly our image as the producer of the world's best rice – an image built up over many decades – will be damaged," he said. The controversy is also fresh fuel for long-simmering anti-government sentiments, prompting renewed protests in the capital. A sad state of affairs indeed, in a Country which has abundance of production. I do agree with all the concepts you've presented for your post. They are very convincing and will definitely work. Nonetheless, the posts are very quick for newbies. What i don't realize is in reality how you are now not really much more well-favored than you might be now.